After clearing skirmish 8, you will be able to enjoy anything related to familiars. But many players think it is unimportant as they can reach Castle 25 without these buildings. Actually, if you can take the advantage of familiar system, you'll get a big boost! Without further ado, let's move to the topic today: How to build up your familiar system? Spring *5 – It's like Manor will help you to max anima storage and boost merging speed. Voodoo Shaman set is very important as it will help you shorten training time and get more training Lv Exp boosts. I bought about 7 $5 Voodo Shaman bundles to make a purple set. If you don't want to buy this bundle, you can forge Mystic Box instead, which only asks for minerals, logs and lava mud. 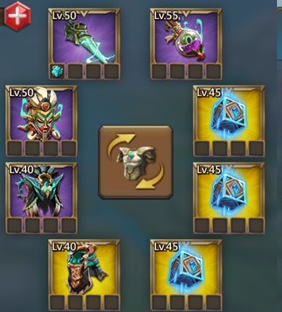 From the beginning, it's good to upgrade those which will grant you more runes, fragments, anima or merging speed, no matter which way your account goes. My priority of cultivating a mob is listed as below. It will take you a lot of resources to get Pact 3, therefore you had better take the advantage of sole & hell events to accumulate some merging speedups. Also, you can use guild coins to buy them. Use these speedups during Moonlight event, which will save you a lot of resources. The main thing that will limit your development for familiars is runes. Most good skills are locked behind stages, and you need runes to advance each stage. Each skill has their requirements, so be careful not to feed it fragments if the next level of the skills requires higher level of the monster itself! Also with runes and fragments – every time you use them, the monster will require more and more of those. This resets with your daily reset time, so if you don't have tons of fragments, I would recommend being patient with it and don't throw 50 fragments for the same amount of exp you can get the next day for 5. Personally, I use fragments 2-3 times per day to upgrade mobs' skills.